Before examining what these teams could offer in return, it’s important to define what type of trade package the Jets would (or should) accept for Bogosian. The Jets currently look pretty good in goal and on defence, but are thin at forward, particularly at centre ice. I strongly believe that a Bogosian deal would bring a young NHL-ready forward (rather than a draft pick or teenage prospect who could end up being a bust) – a somewhat established player of ~21-24 years old, and preferably a centre. With that in mind, let’s consider what potential proposals might look like. New Jersey: Of the teams rumoured to be interested, Ek spends the most time discussing the Devils. While I’m sure they’d love to get their hands on Bogosian, they don’t have much to offer in terms of promising young forwards. Travis Zajac would be the best fit – an excellent #2 centre who finished 7th in Selke Trophy voting in 2009, and of course, a Winnipegger. However, the Devils only have one good centre as it is, so dealing Zajac would leave a huge hole in their lineup. They have a few other quality young players like Mattias Tedenby and Jacob Josefson, but neither has shown enough at the NHL level to merit a trade for a player of Bogosian’s calibre. Montreal: A deal with the Habs makes even less sense, and helps explain why I take everything from Eklund with a grain of salt. Montreal has several good young defencemen to build around (Subban, Weber, Tinordi, Beaulieu, etc) and very few good young forwards. There isn’t a forward under 25 in the Montreal organization that scratches the surface of Bogosian’s value. Next. Buffalo: This one makes a bit more sense. The Sabres are stacked with young forwards – guys like Tyler Ennis, Luke Adam, Zack Kassian, and several others. Ennis is definitely the best of the bunch – a near clone of Patrick Kane, with a little less skill and a bit more jump – but he’s also 5’9, 165, and may be better suited to the wing. Furthermore, the Sabres have loaded up on veteran defencemen like Robyn Regehr and Christian Ehrhoff to complement 21-year-old phenom Tyler Myers. As it stands, they already look like serious contenders, so they might be reluctant to pay a steep price in order to land another 21-year-old defenceman that might not hit his prime for another 5 years. New York I: Of the four teams mentioned, this one makes the most sense. In terms of organizational strengths, the Islanders are the opposite of the Jets – heavy on young forwards, thin on D. They have very young NHL-quality defenceman beyond Manitoban Travis Hamonic, whereas Tavares, Okposo, Grabner, Strome, Niederreiter, and Bailey make up a very strong core of forwards all under the age of 25. While I mentioned earlier that the ideal return for Bogosian would be a 21-24 year old centre, I think the Jets would have a strong interest in 18-year-old Ryan Strome. I still believe the Jets would have drafted Strome in this year’s draft had he been available, as he has game-breaking talent and would be a great complement to Evander Kane. Out of all the 4 alternatives, a package involving Strome makes the most sense. While I don’t believe the Jets are actively shopping Bogosian, I’d be surprised if GM Kevin Cheveldayoff hasn’t listened to some offers. However, I don’t think Bogosian will be dealt. His inconsistency limits his trade value, so a team looking at Bogosian would want a discount – yet it he still possesses tremendous upside. And despite three seasons in the NHL, Bogosian is only 21, and has many years left to develop into a top flight defender. World-famous investor Warren Buffet often says that some of his best decisions were the times where he chose to do nothing. This seems like one of those times for the Winnipeg Jets. My bet is that Zach Bogosian re-signs in Winnipeg – a one or two year deal at around $1.75M a year. This entry was posted in Winnipeg Jets and tagged Ryan Strome Winnipeg Jets, Travis Zajac, Tyler Ennis, Winnipeg Jets, Zach Bogosian, Zach Bogosian 2011-2012 salary, Zach Bogosian 2012-2012 salary, Zach Bogosian cap hit, Zach Bogosian contract, Zach Bogosian contract structure, Zach Bogosian deal, Zach Bogosian salary, Zach Bogosian signing, Zach Bogosian trade rumours, Zach Bogosian Winnipeg Jets by Peter Siamandas. Bookmark the permalink. How did you come to Bogo’s earnings per year for a new contract? Thx. I looked at a comparable player. Jack Johnson – drafted 3rd overall in 2005. He was always loaded with talent, but had a few underwhelming seasons to start his career. 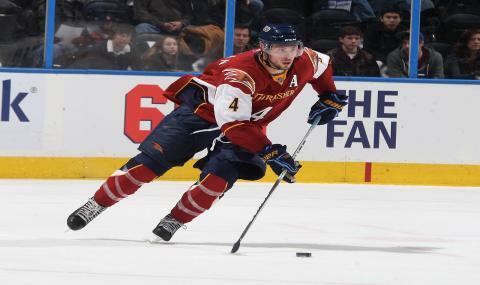 After his entry-level contract expired in 2009, he signed a 2 year, $1.425M deal. Bogosian’s statistics are a little better than Johnson’s, so I gave him a little extra ($1.75M). If I’m off at that number, I’d say it’ll be higher, not lower. $2M. I agree with you that I don’t think Bogo will be traded, in fact I’d be shocked if he was but I think the salary you’re projecting for him is way off. It’s impossible to know until he’s signed but my guess would be he’d get something in the range of 2 years, 7-8M. Only time will tell though.